The American Lands Council recently came to Oregon to discuss the dichotomy between Eastern and Western states in the percentage of land owned by the federal government. Western states have been left behind in the original federal promise to quickly dispose of federal lands after statehood is granted, and it has cost those states the ability to properly administer their own economy. On November 22, Ken Ivory, President of the American Lands Council, came to Oregon to talk about the power of unlocking pubic lands in Western states. He explained how the federal government had shirked its promise to the Western states; how local control was the vision of the Framers of the Constitution; and how local land control would be an immediate solution to budget woes faced by schools, state legislatures and municipalities out West. Western states perpetually lag behind the nation in educational funding, economic development and tax revenue. In his presentation, Ivory repeatedly stresses that every State, upon admission to the Union, relied upon the federal government’s trust duty from 1780 forward to dispose of the public lands. Indeed, the solemn compact of statehood included the ability to access the lands and the resources they provide. Imagine, for instance, if North Dakota were principally under federal control. No oil boom. No economic development. No ability to create state budget surpluses based on an unemployment rate that is half the national average. Well, that's exactly what's happened in states like Oregon, Utah and Nevada. The inability to access the resources provided by the land within their borders has led to a tax base that is a fraction of what's required to fund basic services in these states. The way that Ivory presents the solution is, "The only solution that's big enough". What Ivory and the American Lands Council propose is, as he likes to say, simple but not easy. Extinguishment of federal title over public lands in the Western states was clearly intended by the Framers of the Constitution, is the proper thing to do to rebalance the power of the states vs. federal power, and is the logical thing to do to remove dictatorial power of Washington DC over lands that rightfully belong to the people. It is long past time that we explore such solutions. Why does the federal government own so much land? They've been at this for way too long! Time to give it back to the states and individuals! 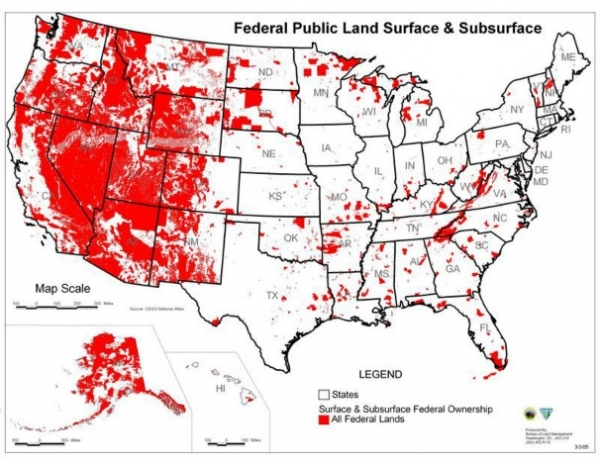 In some states, aside from large areas that are inhabited, the federal government literally owns the rest of the state and controls what is done on that land. I don't believe for one minute that was ever supposed to happen, but most of what is going on in this country right now is well outside what the consitution was supposed to protect the states and the people from. Sadly, the Supreme Court has failed to stop it by using the very constitution by which they are supposed to make their findings. In 1773 the Sons of Liberty organized the first tea party in Boston harbor. On April 15th 2009 many of you joined with us and millions of other American across the country at over 500 modern day taxpayer tea parties, 20 here in Oregon.The tea party movement began in response to corporate and mortgage bailouts, the $1 trillion dollar debt stimulus plan, and President Obama's $2 trillion dollar budget deficit. On June 6th we want you to join us for a day of organizing, training and educating. We will have national and state campaign and policy experts in attendance to answer your questions and help you organize your community.Now is our chance to take back our nation, we are the new Sons and Daughters of Liberty. We can pass on the same legacy we received from our ancestors to our own children and grandchildren.Join us on Saturday June 6th from 9:00 am to 5:00 pm at the Red Lion in Salem, Oregon for the 2009 Oregon Liberty Summit. This will be a celebration of freedom and liberty, including campaign and issues training, featuring campaign and policy experts and hundreds of activists from around the State of Oregon.For more information and to register please visit OregonLibertySummit.com. This week the Democrat co-chairs of the Ways and Means Committee announced their budget plan. It includes an $800 million tax increase on the “wealthy”. In reality the tax is a job killer, a massive increase targeting small and family businesses. All in a time when Oregon has 12 percent unemployment, the second highest in the nation and still growing. In recent testimony delivered before the Oregon Senate Environment and Natural Resource Committee by Dr. Eric Fruits, Ph.D. on Oregon’s SB80, published by cascade Policy Institute, Dr. Fruits stated the following. The Oregon Legislature is seriously considering dozens of tax and fee increases, including new taxes on big and small business as well as Oregon families. The May budget forecast is expected to fall short of prior estimates. It is possible that the budget hole for the 2009-2011 biennium may exceed 4 billion dollars, requiring the Democrat lead legislature to either cut budgets and reduce services or raise job killing taxes.